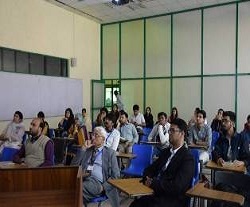 Benade Physics Society along with the Department of Physics organized a talk on 17 March 2017 on ‘Nanoscale Mass Transport across Two Dimensional Materials’ . The event took place at 02:00 pm in the Armacost Science Building. Talk was delivered by Dr Kemal Celebi, who is currently serving at Bilkent University, Turkey. He has done his BS degree from Bilkent University and MS degree from MIT and PhD from ETH Zurich. His current research interests include the problems in membrane science and Nano fluids. 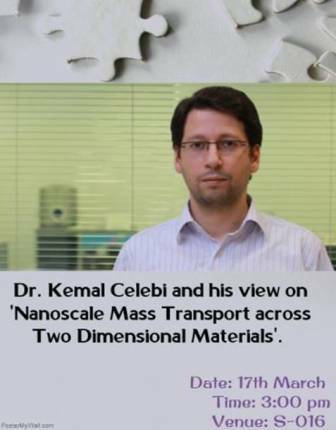 He talked about the ‘Nano scale mass transport across 2-D materials’. 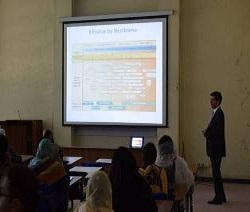 The talk was attended by the physics majors of Baccalaureate and Postgraduate students. The talk was very factual and an explanatory one.